At MyWalkGear.com, we offer a variety of personalized Breast Cancer Awareness gifts, merchandise and walk gear for our customers. The following items are our best sellers. All of these would be great to wear and carry at your next breast cancer walk, and all are offered at an incredibly affordable price. From Breast Cancer shirts and sweatshirts to Breast Cancer mugs and car magnets, we have the merchandise that will help you spread the word about a cause that's near and dear to your heart. 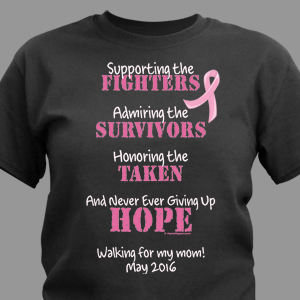 These make great gifts for fundraisers, benefits, and awareness walks in your area.